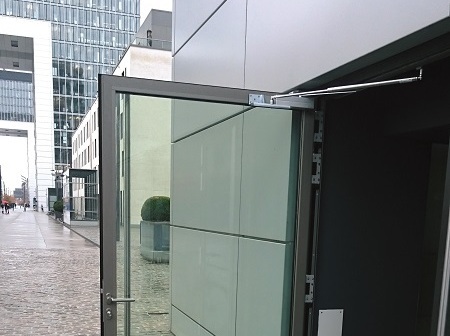 External, outward-opening doors are often vulnerable to being thrown open by strong winds. The larger the door, the more effect the wind will have upon it, the faster the door will accelerate and the more energy it will carry. 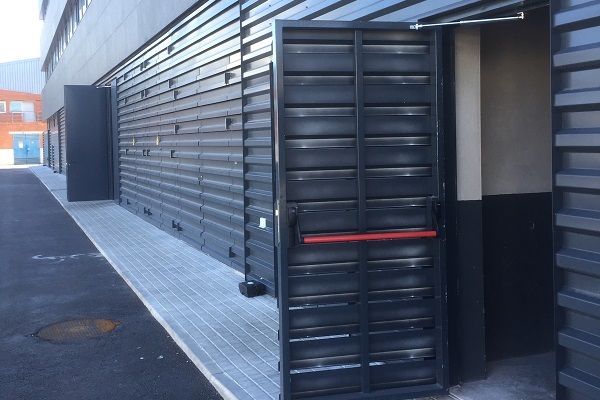 A heavy door traveling at speed can cause severe damage to the door closer mechanism, the door frame and surrounding structure as well as the door itself. There is also the risk of personal injury if someone is struck by the door. The following examples illustrate how the risk of personal injury and structural damage can be avoided by installing DICTATOR Back checks. Grifols, a pharmaceutical and chemical company based in Spain, has recently expanded its head office. One of the new buildings features external, outward opening doors. These doors were being caught and thrown open by strong gusts of wind, causing a potential hazard to people passing by. Basing their calculations on the size and weight of the doors, DICTATOR engineers were able to offer the best Back Check and mounting positions to ensure optimal control. The doors fitted with Dictator back checks now open in a slow and controlled manner. The Kranhaus Nord (Crane House North) is one of a trio of modern landmark buildings designed to mimic harbour cranes in the old port of Cologne, Germany. The buildings feature a mix of residential and commercial accommodation. The entrance door to one high-end shop was regularly being thrown open by strong gusts of wind. With the door weighing 140 kg, the inevitable result was repeated damage to the overhead door closer and the door. DICTATOR were consulted for a possible solution. The outcome was a back check installation that works in conjunction with the existing overhead door closer to provide optimum operation and control.